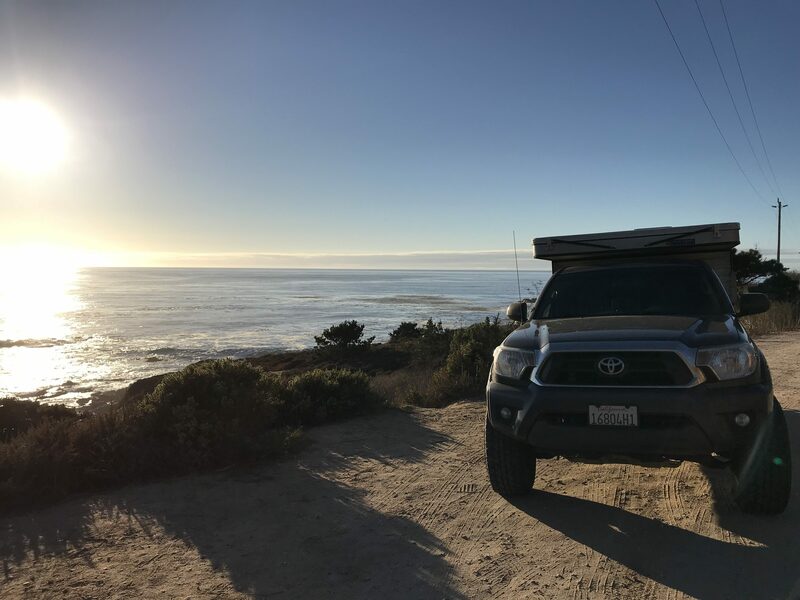 Four Wheel Campers Are Changing The Overlanding World Forever! We love all types of campers here at Van Clan; from your Mercedes Sprinter Conversions right through to your small travel trailers, if we find a vehicle that’s fit for off grid living then it’s good enough for us. 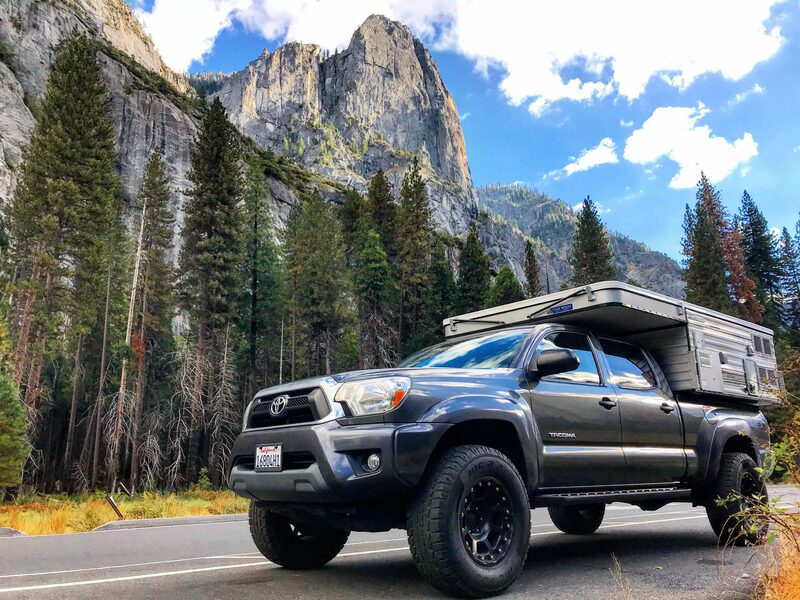 Usually, our experience with testing out campervan conversions lasts a few hours at most (we have serious commitment issues), but if you’ve been following us on Twitter and Instagram you’ll know that we’ve spent the past week in the United States of America test driving two four wheel campers across California! 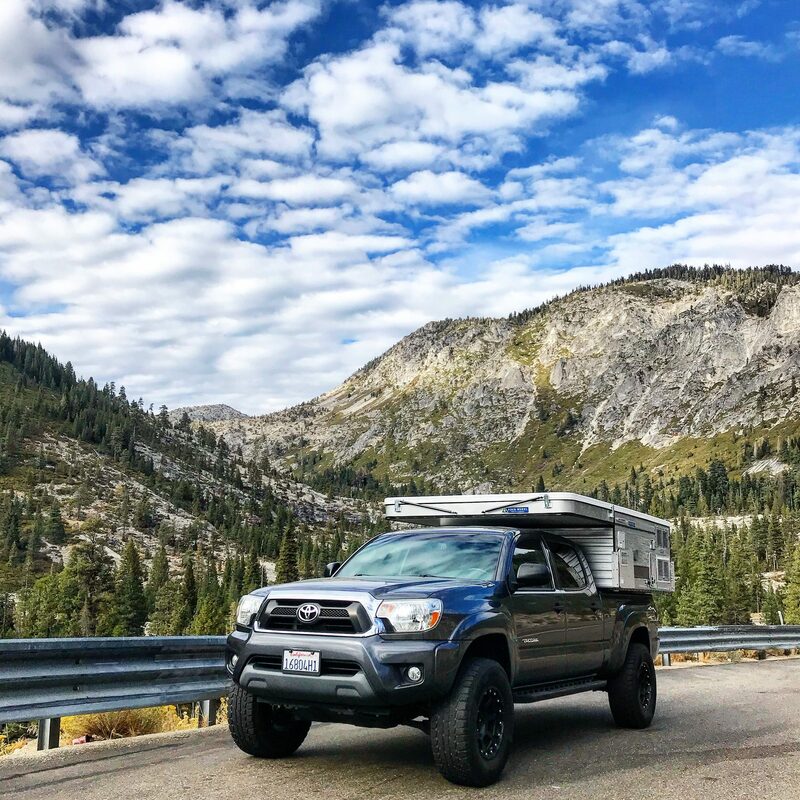 We’ve had an amazing time checking out some of the incredible sights and top road trips that California has to offer, but more importantly we’ve driven these fantastic trucks over 600 miles of wet and rough terrain and managed to avoid getting eaten by a bear (that’s a big win for us). So without further ado, let us introduce you to our four wheel campers. So how did two British automotive journalists come to be sitting under an awning in a national park in America eating crisps and writing in the rain I hear you ask? 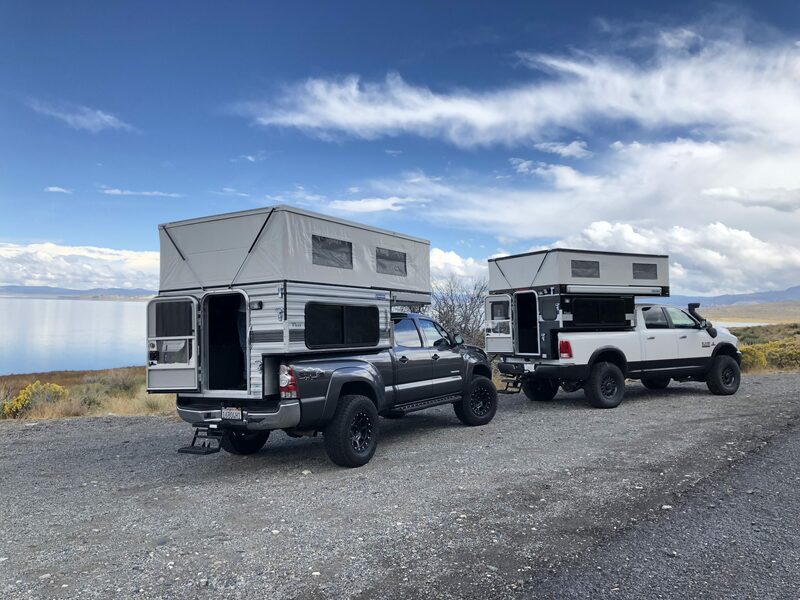 Well, if you’ve been keeping an eye on our social media you’ll know we came to America to work with Four Whee, a four wheel campers company that specialises in custom built truck campers. After a little tour of San Francisco and a few craft beers in Napa (big shout out to Stone Brewing! ), we headed down to the Four Wheels Co workshop to see how these brilliant pop up campers are born. The aluminium frame has some give in it for those bumpy dirt roads, but it’s one reliable structure that won’t fail you over tough terrain! Four Wheel specialise in making simple adventure vehicles that can handle the toughest of environments. 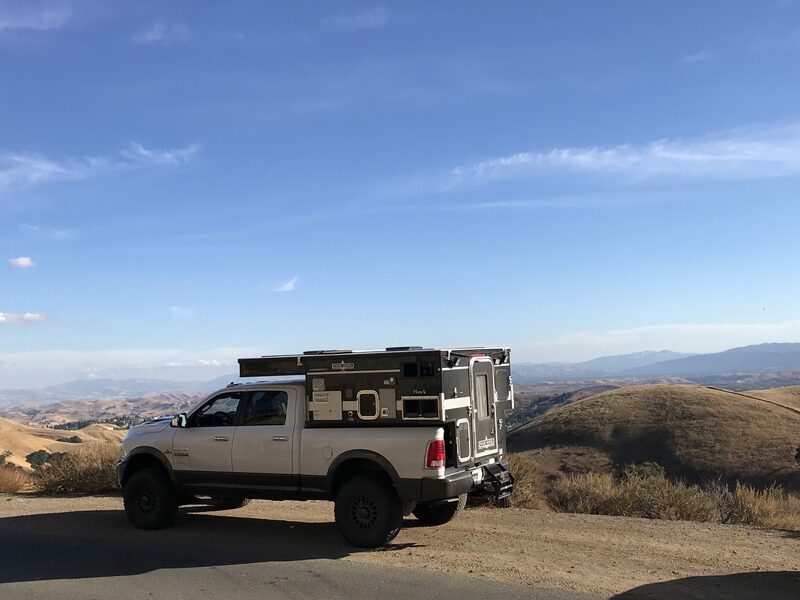 Twinned with powerful 4×4 trucks that can make living off the grid as easy as a stroll in the national park, these off grid living campers are designed to keep you comfortable on the go and provide you with a home from home whilst you’re out exploring the world. 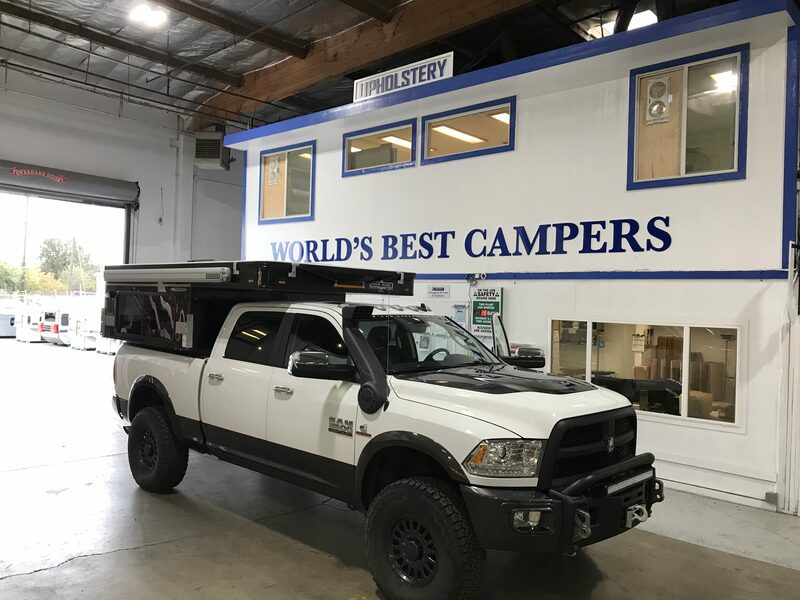 Over 85% of the four wheel campers that the company makes are custom made to the buyer’s exact specifications, and each build takes around 2 to 3 months to build (due to high demand). Now you might be thinking that that’s a long time for a machine to make up a camper, but that’s where you’d be wrong. All of the tiny homes that come from the Four Wheel workshop are built by hand by skilled workers that are passionate about van life and exploring the wilderness. They know how important it is to create a comfortable and functional living environment whilst you’re on the road because they’ve learnt what you do-and-don’t need from their own experiences, and now they’re passing on their tricks and secrets to consumers all across the world. We were lucky enough to get our hands on two different Four Wheel models; the ‘Fleet’, and its steroid infused brother, the ‘Hawk’ (it might not have had wings, but when the Hawk was combined with the Dodge Ram truck it flew around those country bends!). But before we get into the interior and you get all excited about checking out our holiday snaps, let’s chat a little bit about how these four wheel campers are made. The ethos behind the build is simple; Four Wheel want you to have a quality product that will last the test of time and the elements, and they do this by using an all aluminium frame without any wood that can rot or damage in wet and windy conditions. The aluminium frame is sturdy but has enough give in it, so it’s not going to cause any problems when you’re tearing over those unpaved roads and utilising your trucks 4×4 capabilities. The roofs in the older models used to be made up of fibreglass panels that had been stitched together, but now they’ve changed to using a single piece of aluminium that doesn’t have any joints for pesky water drops to sneak in through while you’re having a snooze. 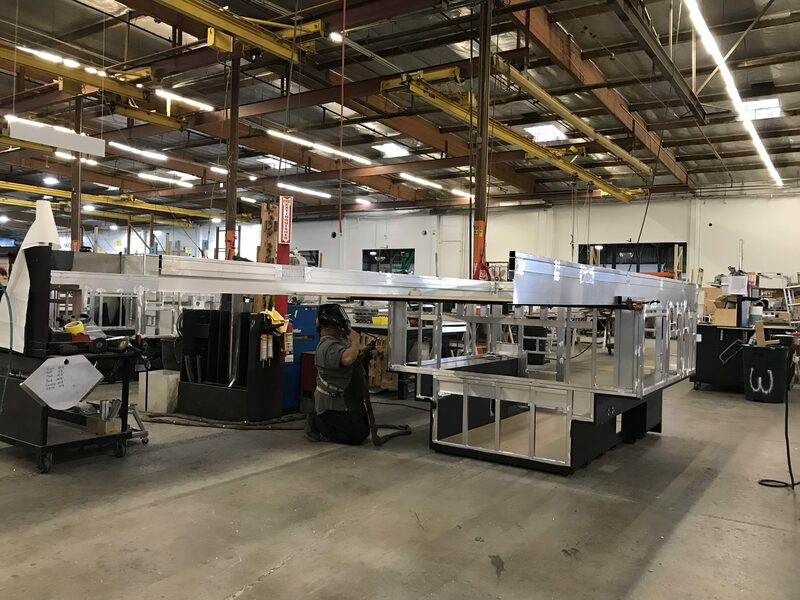 Each Four Wheel tiny house on wheels weighs around 1300 pounds once constructed, which is pretty light if you consider what goes into the bones of each build. Every drawer, cupboard, table and ledge is made to measure using automation tools controlled by skilled engineers, and they use as much wood as possible to avoid wastage – if you’re looking for top eco campers then look no further! So How Do I Take These Four Wheel Campers On And Off? 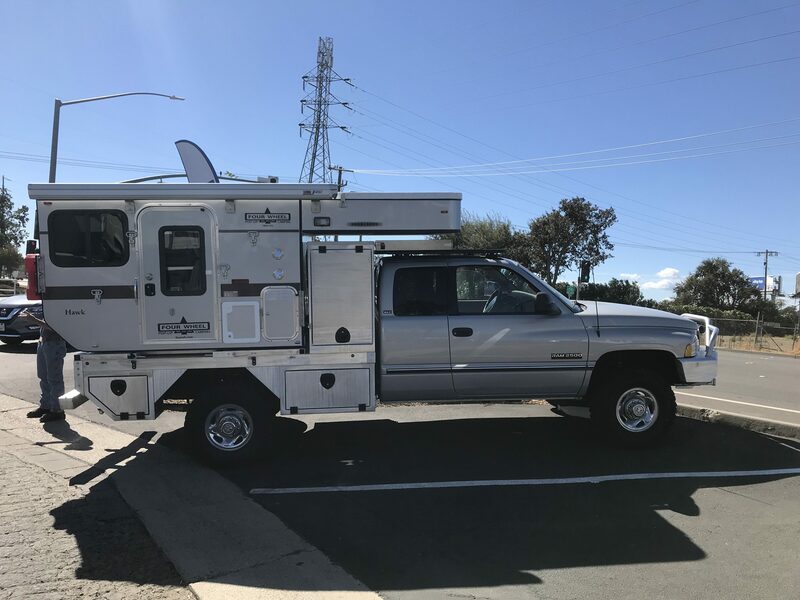 You may have checked out the video on our website about the ‘truth about pop up truck campers’, and if you have then you’ll know that these pop up truck campers attach directly the truck bed itself. 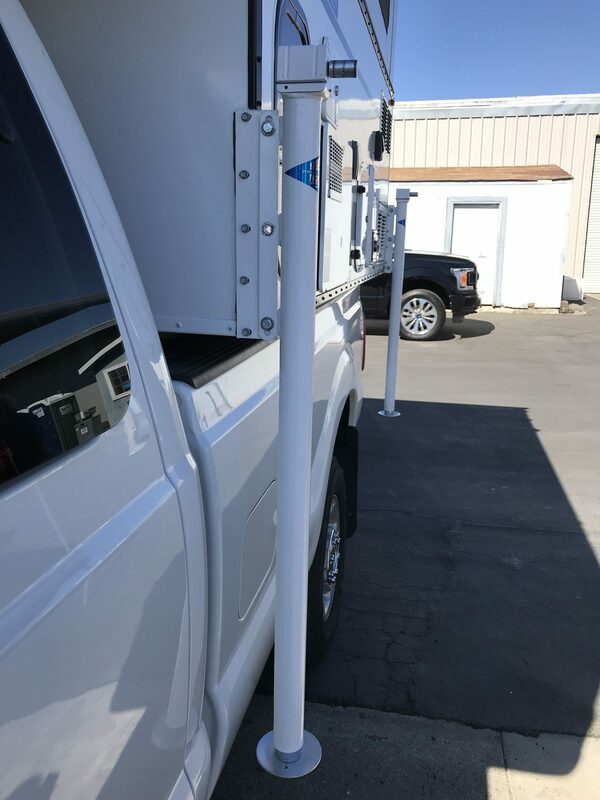 They’re installed in the factory and bolted down to your vehicle’s truck bed, but that doesn’t mean that that’s where they have to stay! 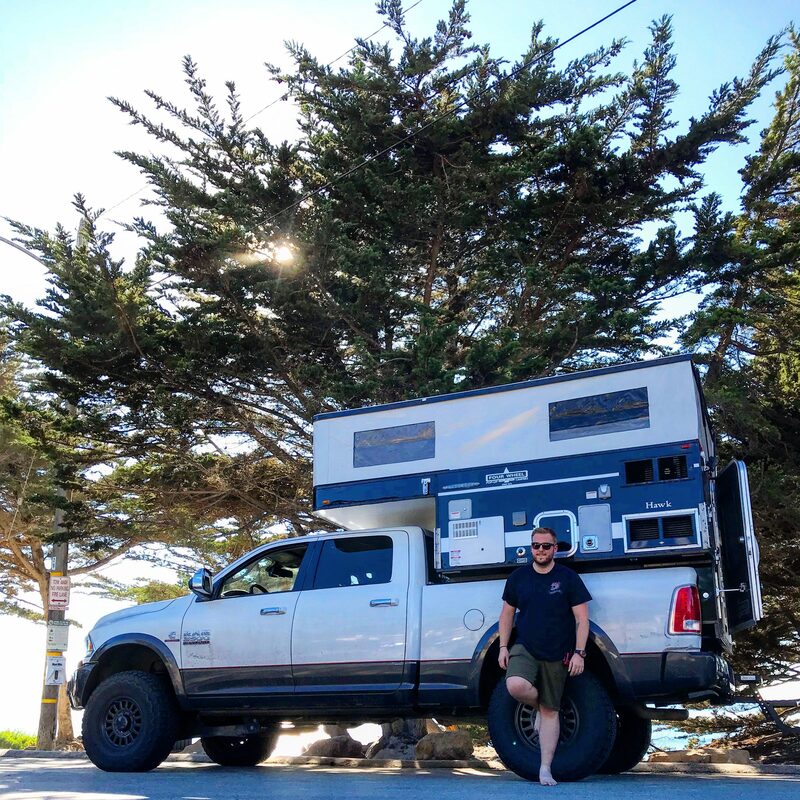 The beauty of these four wheel campers is that they can easily be removed and re-attached by the owner if they want to use their truck as an everyday vehicle too, making these truck campers an affordable solution for the digital nomad that wants to get off grid on a budget. Four stabilising legs can easily be attached to metal plates on the side of the camping pod (check out the picture below). Then it’s just a case of putting down the legs, unhooking the connectors that are attached to the truck bed and then driving your truck out from underneath. That’s it! 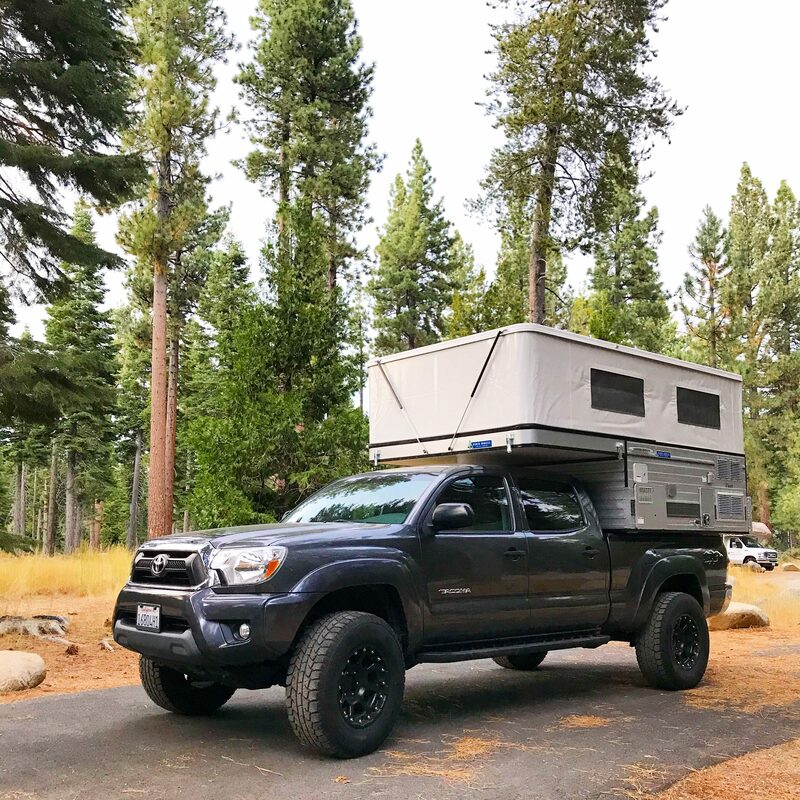 Reverse the process to re-attach your four wheel camper to your truck, and then you’re good to go! 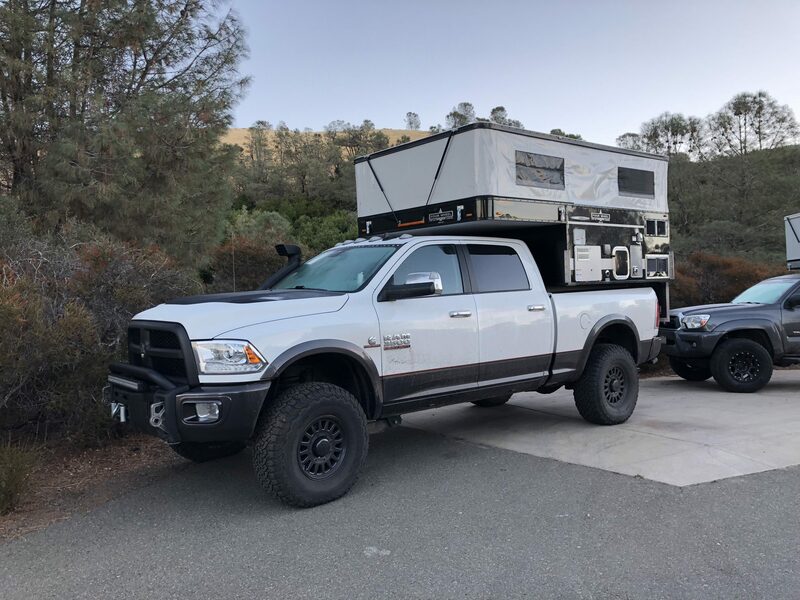 One point that we should add here is that if you’re going to want to use your truck as an every day vehicle as well as a camper then you’ll need somewhere to store your tiny home when it’s not in use. The stabilising legs mean that you can store it on uneven ground or even on a hill, and the camper is seriously weatherproof, so you don’t need to worry about it being outside when it’s not being used. We would prefer to have it in a barn or a garage, or even under some tarpaulin to keep it safe, secure and clean for the next time you want to use it. The show-stopping element that makes everyone’s heads turn has to be the pop top. Open your six ‘flip down’ latches and the pop top slides up with a gentle push that can easily be done by one person thanks to the piston assist mechanism at the front and back of the camper. It’s so easy to put up that a tired writer/monkey could do it with their eyes closed, which is exactly what you’ll be doing when you’ve had a long day adventuring or hiking around national parks. The rugged vinyl side liner is strong and durable and doesn’t look as though it would show any signs of wear or tear easily. And then there are all of the tasty extras that make living the road easier and more bearable for those of you that like your home comforts. Let’s start with one that will get even the most sceptical campers on board – a hot exterior shower! Yeah, that grabbed your attention, didn’t it! Both models come with an exterior socket for your shower hose to fit into, and a showerhead that turns on and off with the touch of a button. You can control water temperature from the outside too, making this shower great for a full wash or just de-sanding your feet after you’ve hit the beach. Each of these four wheel campers come with a compartment that can hold two gas canisters, so you don’t have to worry about picking up a canister if you run out as you’ve already got a spare one to hand. If you run out just attach the nozzle to the second canister, and you’re good to go! 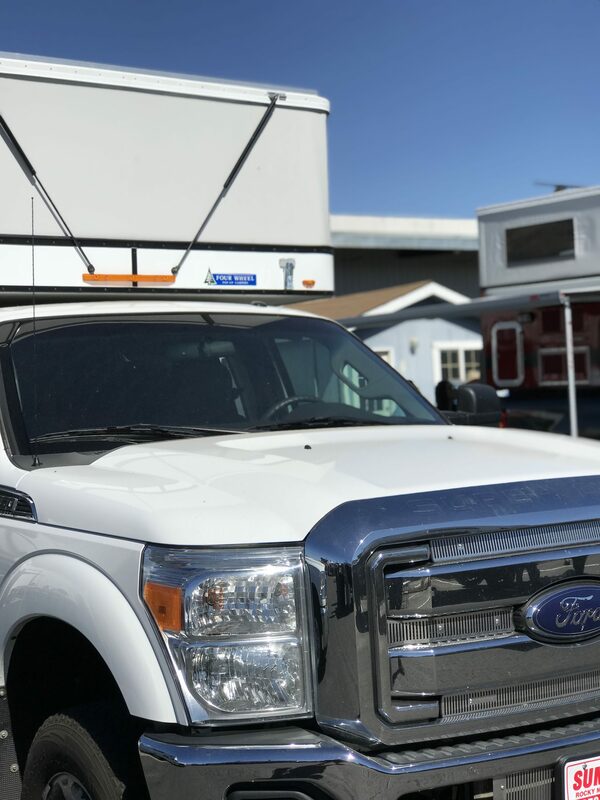 There’s also another lockable storage compartment on the outside of the van for all of your electrical hookup cables and your shower tray, along with hatches for your fridge fan and water storage. Each camper can hold 26 litres of water (6 in the hot water tank and 20 in the freshwater), and the wastewater outlet is easily accessible and simple to use. Wait…did we just say hot water? YES, WE DID! And the 12v water pump means that you can get pressurised water anytime you want. Say goodbye to pumping with your foot! There’s also an inlet for ‘city water’ so you can pump water straight from the campsite rather than filling up your tanks. The larger ‘Hawk’ model that we had on the road with us also came pre-equipped with solar to keep the batteries charged up in the sun, and both models have a split charge relay that charges the batteries up while you’re driving. 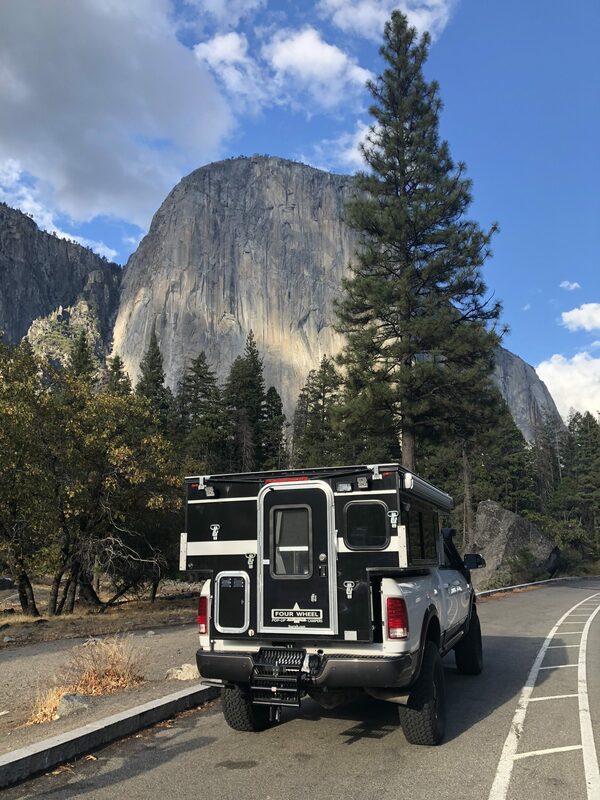 We’ve been on the road for a week, and the batteries in these four wheel campers have been fully charged 24/7 – going off grid doesn’t mean that you have to leave your gadgets behind! 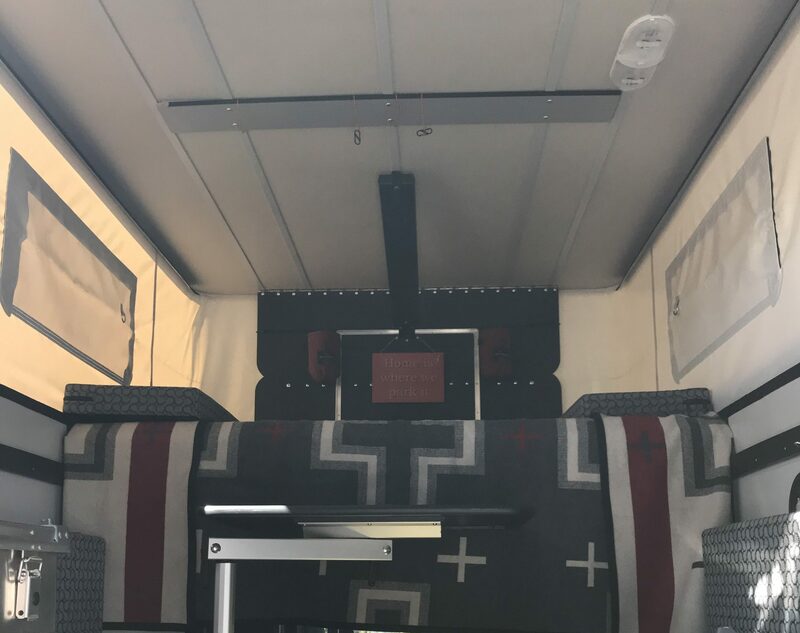 The Hawk also came equipped with an awning, another accessory that you can ask to have built into your custom camper. Four Wheel also do Bat Awnings for 270-degree cover too – how awesome is that! 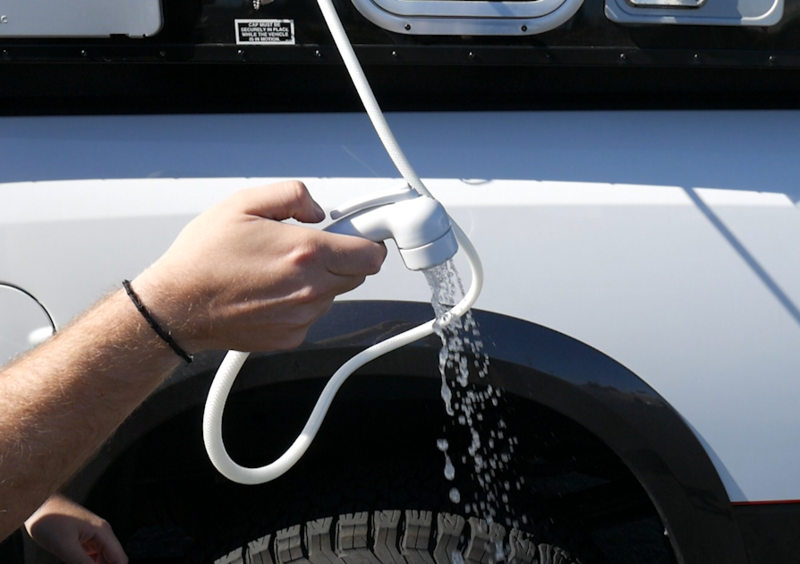 All of your electric hook up sockets are in easy to reach places on the outside of the vehicle, making it easy for you to hook up to campsite power when you’re stationary. NB – This is the only way to provide you and your campers with 110v electrics like you’d find in the good old American household (European models come with different plugs, and you can currently pick one of these beauties up from Germany!) Unfortunately there isn’t the option to run an inverter from the solar panels and batteries alone just yet, but here’s hoping that there could be an upgrade very soon! Some Four Wheel Campers owners take storage to a whole new level! And the optional extra’s don’t need to stop there! On the way to the Four Wheel meet up we joined a convoy of customers that were heading to the event to show off their custom campers and how they’ve added their own stamp onto their builds. 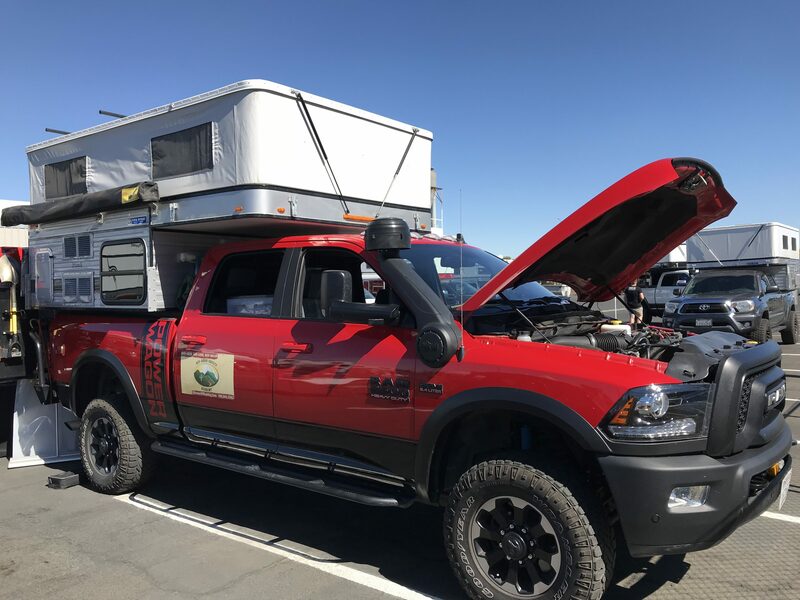 The customers we spoke to were all about the ‘aftermarket dollars’ and how you can keep adding to these campers for very little money. One van had a roof rack with a kayak and two surfboards on it, and another had an array of hooks for wetsuits and climbing gear on the back. We even spoke to a customer who uses his Four Wheel Camper to visit the arctic circle. You could do it too with a little help from AEV. We’re going to make a quick detour to talk about AEV, or the American Expedition Vehicle. So you know that I mentioned aftermarket dollars? Well AEV in Michigan specialise in making parts that can turn your truck camper into a mega-behemoth machine that tears across the land like a rocket. 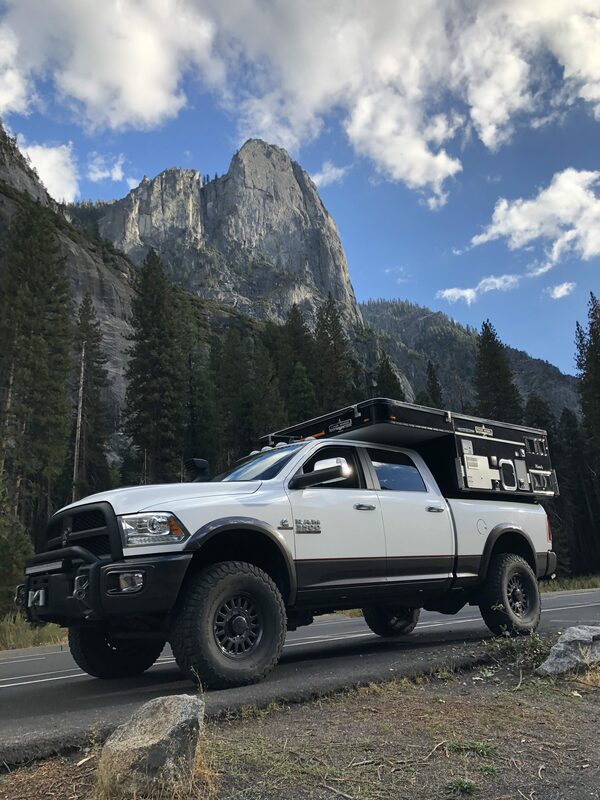 The Hawk model that we took on the road was mounted onto the bed of a Dodge Ram that has been converted by AEV, and it drove like a dream! 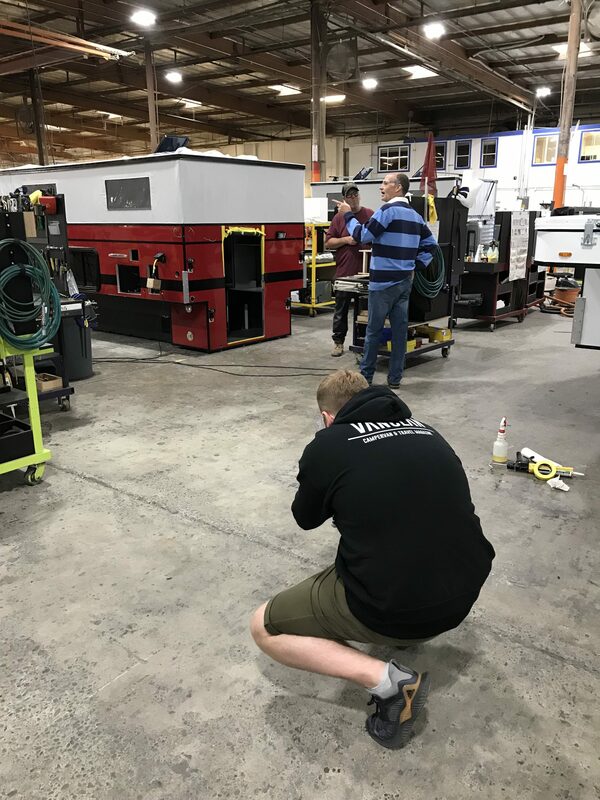 AEV spend millions of dollars every year testing individual pieces of adventure equipment to make sure that they pass the safety and quality checks that original equipment manufacturers require. 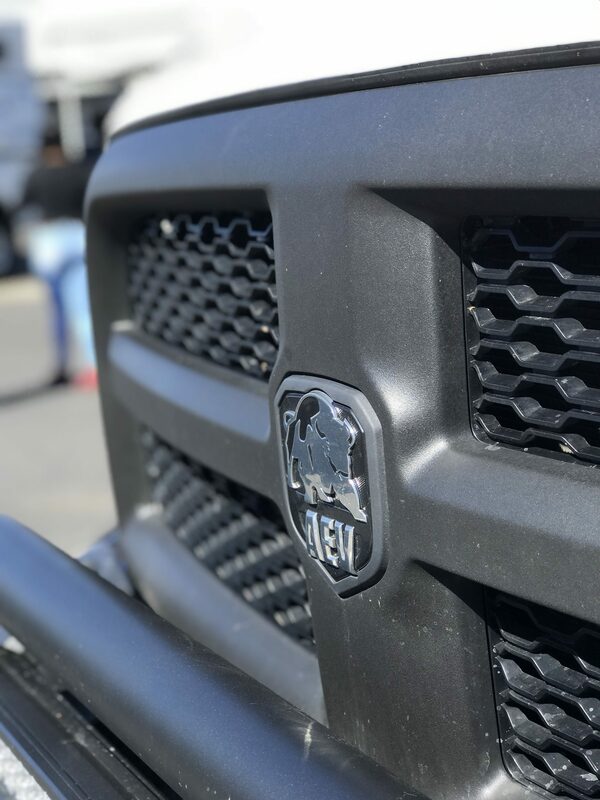 The Dodge Ram is one of the only trucks that AEV make these souped-up parts for, and because Dodge have authorised them to create add-ons for their vehicles, you don’t lose your original manufacturers warranty for your truck. It’s all above board and it means that you don’t have to mess around fitting bits yourself that might not turn our the way that you had hoped. 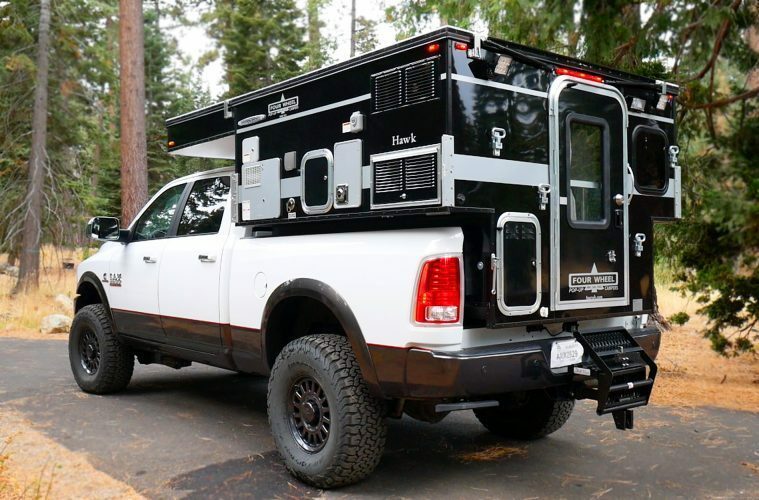 This Dodge Ram has been transformed into an all-terrain adventure vehicle! 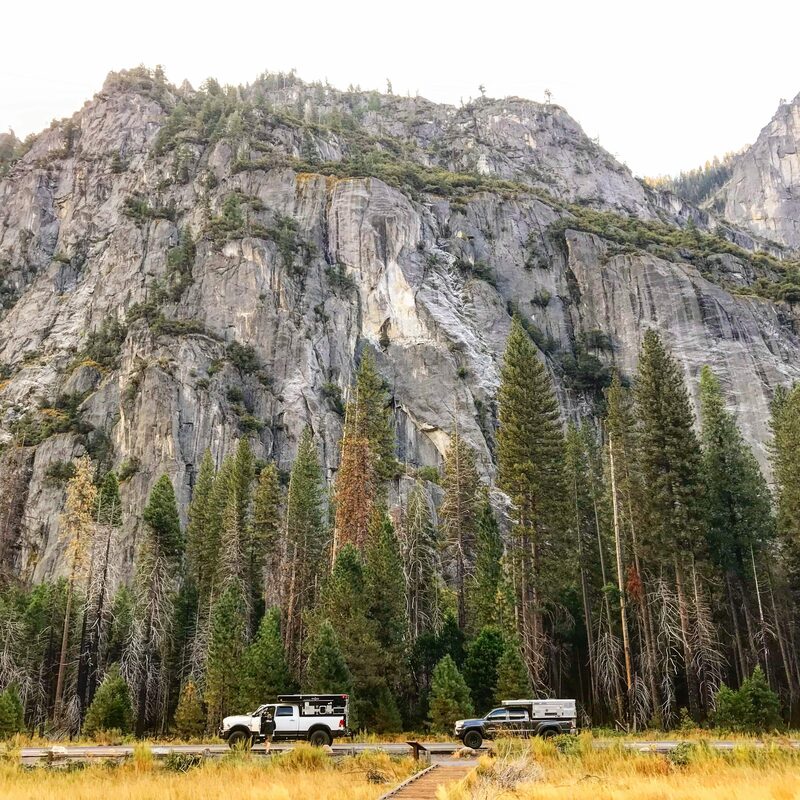 While you don’t have to have an AEV vehicle to carry these truck campers, we’d recommend looking into the possibility of getting one if you’re planning on going over some severe terrain or spending a lot of time exploring off the grid. If you’re going on little trips to national parks or campgrounds then you’ll be fine with your existing truck, but you’ve got to admit the 31 inch tyres and massive suspension look pretty cool right?! What’s Inside These Four Wheel Campers? Ok back to the campers. The real magic happens when you fold down the metal steps and climb up into the camping pod itself. With the pop top raised you’ve got just over 6 foot of standing room to play around with – I’m about 5’10” and could easily stand up while cooking etc. There’s plenty of side space to prepare food (thanks Four Wheel for sending us out on the road with some top cooking accessories!) and the four wheel campers come with a two burner hob and a sink that has that all important hot running water! Underneath the sink and hob area, you’ve got lots of little compartments with latch-lift doors. There’s a big cupboard space for your pots and pans, groceries and dried food, and some smaller drawers and hide holes for cutlery, dustpans and other household items that you might need on the road. There’s a big fridge for all of your cold items and a little freezer compartment for frozen sweet treats or prime cuts of meat. 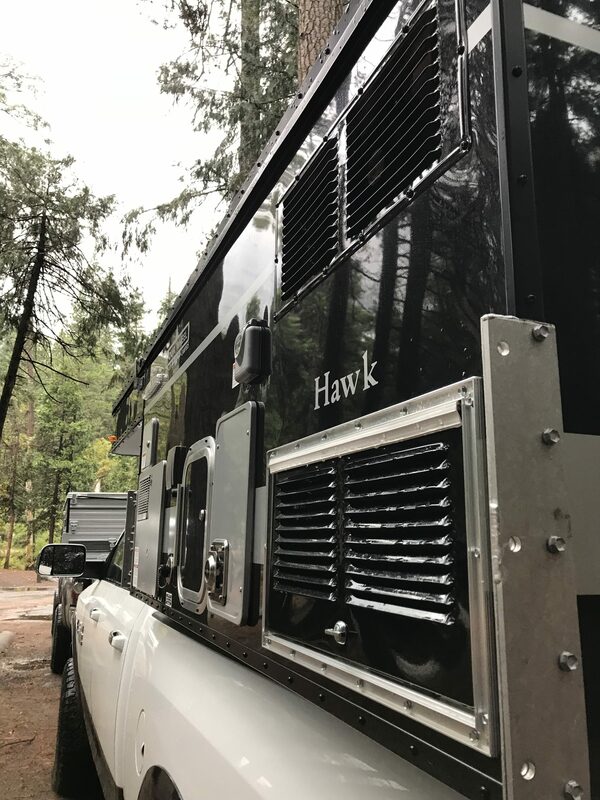 The ‘Hawk’ comes with a slightly bigger fridge, so if you’re a hungry camper then you might want to consider upgrading for that extra shelf space. 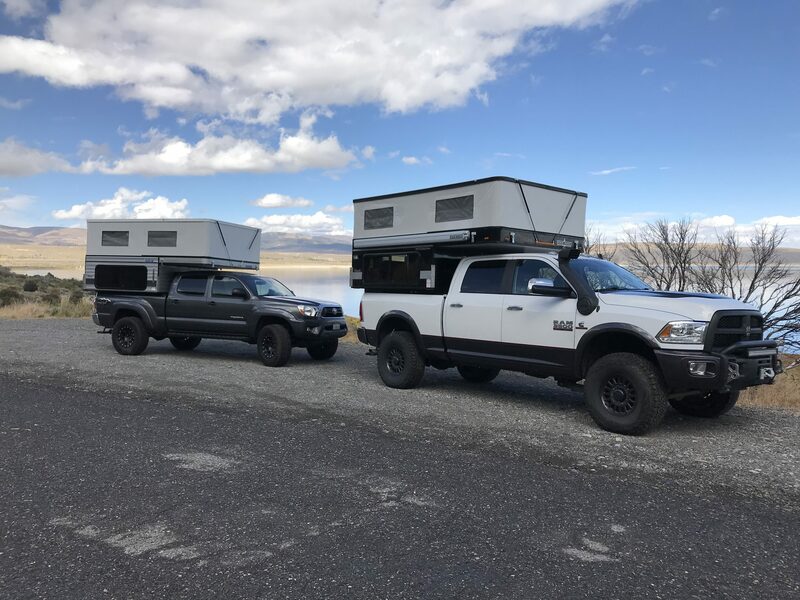 Both of these four wheel campers have a furnace that blows hot air out into the living area, which is a nice addition when it’s minus 1 degrees Celsius on the shores of Lake Tahoe (I’m speaking from experience here, that was one cold night!). 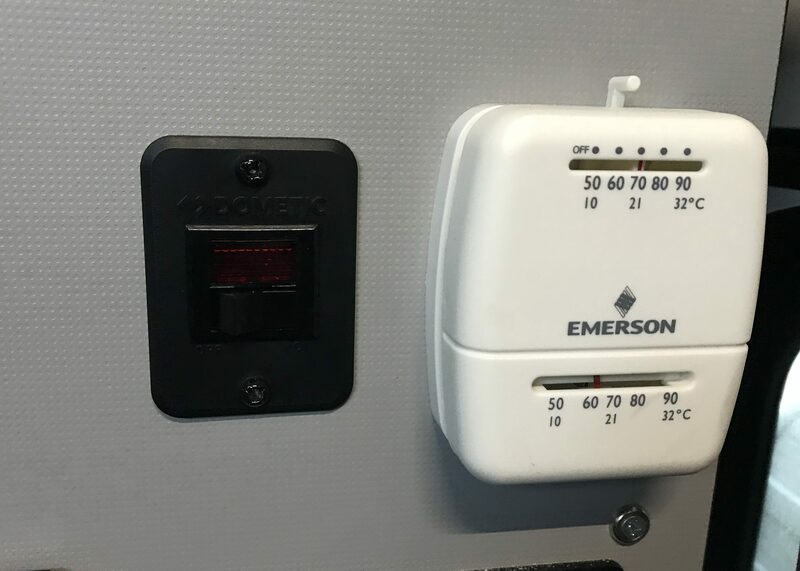 The furnace controls are situated right next to the bed which is brilliant if you want to crank the heat up while you’re under the duvet (no euphemism intended! ), and for those of us who still can’t get the hang of Fahrenheit the furnace controls are also in Celsius. 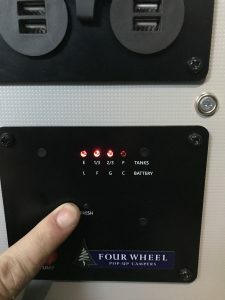 Four Wheel have tried different heating control panels in their builds but have settled on an analogue slider, and it works so easily without having all of the unnecessary bells and whistles of a digital control panel that you don’t need. Give me warmth, not the time in seventeen different countries! There’s a flip-out table that can spin around to face either the back bench or the single seat for working at or playing games with the family, and the single seat folds down into a single bed for your little one or extra traveller. 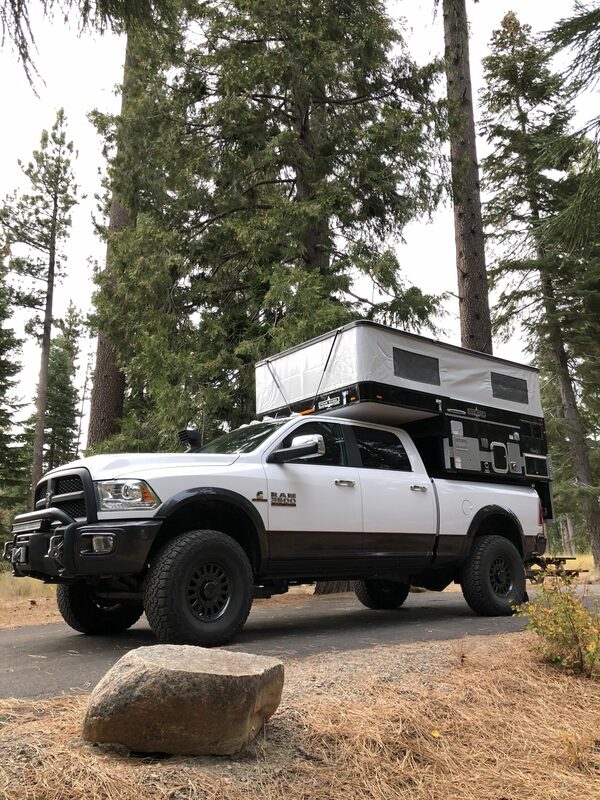 Speaking of beds, these four wheel campers have an extendable bed frame that you can pull out and add extra seat cushions in to make a sleeping platform fit for royalty. They start off as a queen size but can extend to what I called ‘the ultra-king’ whenever I climbed up into bed. The bed is seriously comfy for such a lightweight piece of foam and I woke feeling rested and ready to get on the road every morning! Each of the windows has a privacy flap in case you don’t want your neighbours looking in, and they also come with a transparent plastic flap and mosquito netting if you want to get some fresh air into the camper to waft away the smell of your dirty socks. 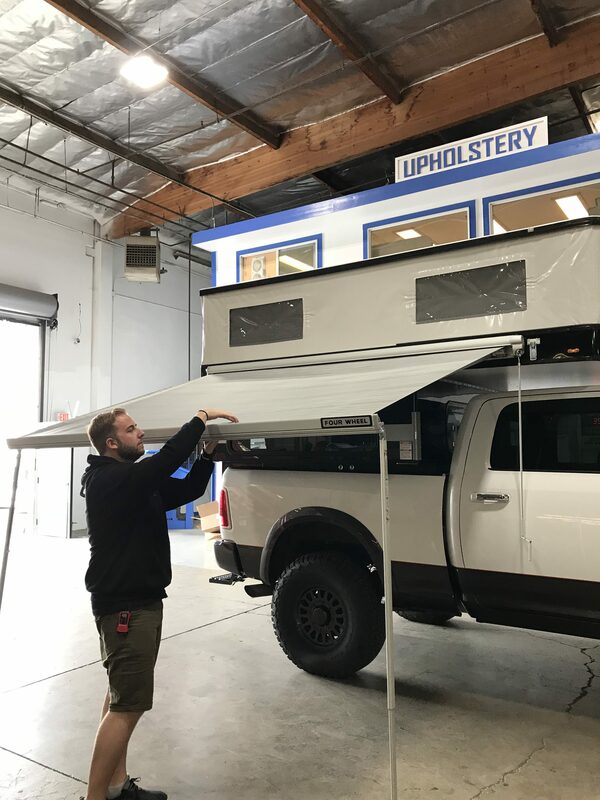 All of the window components attach with velcro so they can stay stuck in place when you pack down, saving you even more time when you park up and pop the top! The lights in these four wheel campers are all low voltage LED’s that pack a punch when they’re turned on. There’s two located in the bed area and one above the kitchen worktop, so you can keep your camper illuminated when the sun goes down. They’re bright enough to see what you’re doing when you’re cooking and reading, and they also dim down by touching the sensor panel. 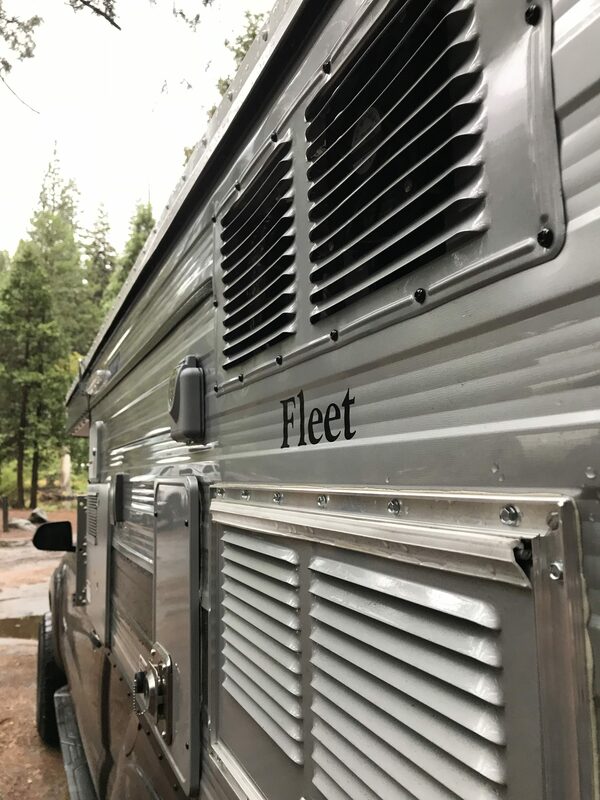 There are also two extractor fans for getting the steam out of the camper when you’re cooking and for bringing cold air in if you get a little too hot. If we bought our own model we’d probably ditch the second fan over the bed area and have a porthole style window that we could use to look up at the night sky and watch the sun come up. 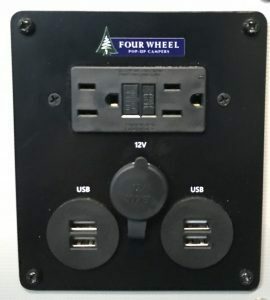 Can I Charge On The Go? 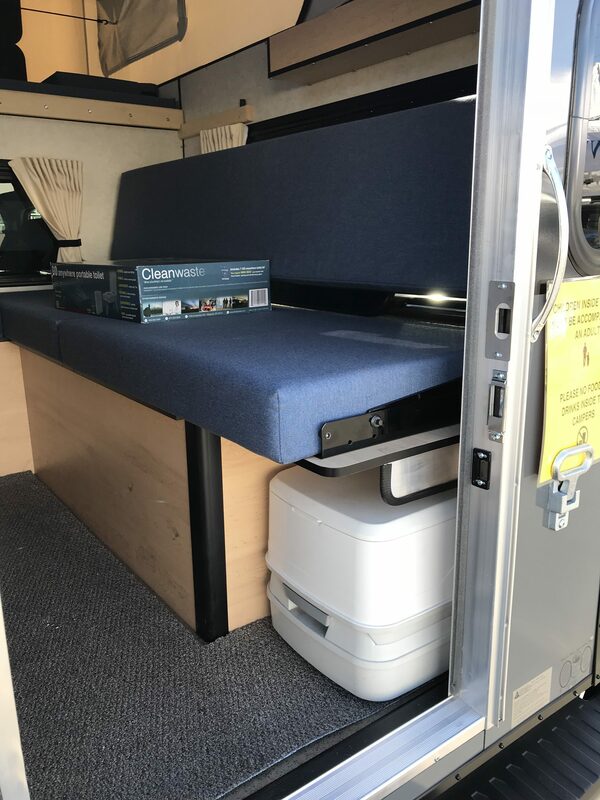 The ‘Fleet’ version of these four wheel campers has the 12v and USB charging ports underneath the radiator controls, which is super handy for charging your devices whilst you’re in bed, but because of the solar placement in the ‘Hawk’ the USB’ sockets were next to the fridge which made charging whilst operating from bed a little tricky. 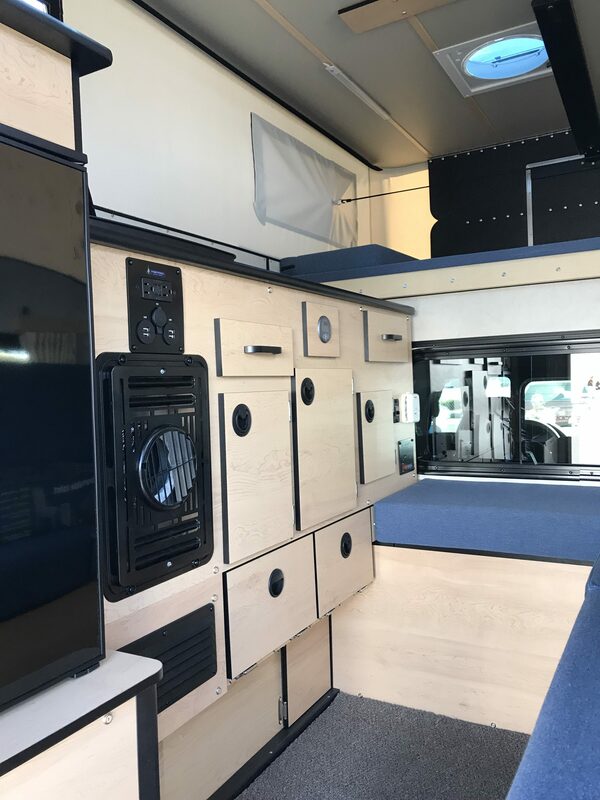 Again, this is something that you could specify when you make your order for your own four wheel campers – they really are entirely custom made so that you can get the exact layout that you want. Throughout the week I charged my phone, headphones, Nintendo Switch and sat nav from the USB ports and the battery didn’t go down at all. The beauty of having split charge relays in these beasts is that when you’re constantly topping up the batteries while you’re driving, so you never need to worry about losing your off grid gadgets again! You also get a handy push-button system that shows you how much fresh water and battery you have at any time, so you can prepare to fill up and/or charge before you completely run out. We didn’t have toilets in the units that we took out, but we were provided with a ‘use anywhere’ toilet if we got caught short in the mountains. 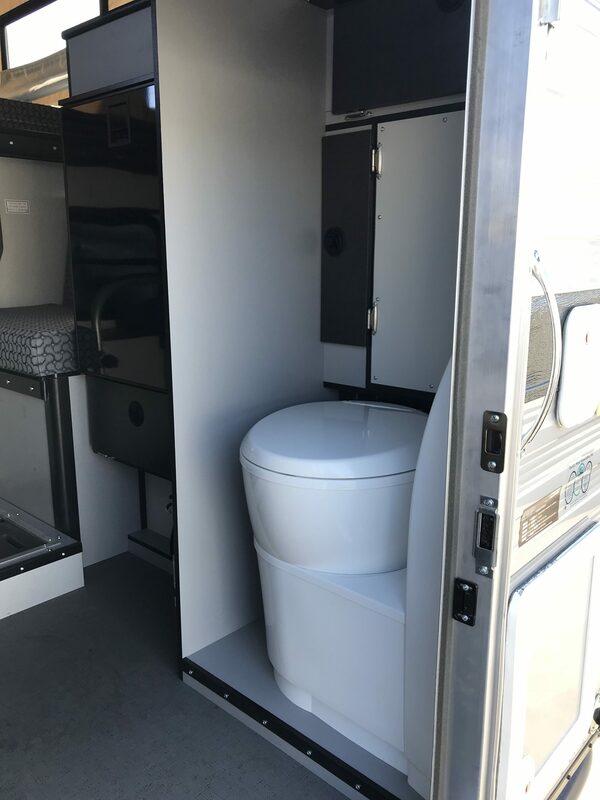 You CAN include a toilet into your build, be it a fixed one or storage for something like the Thetford Porta Qube that you can slide in and out when you need to empty and refill it. Again, these four wheel campers can accommodate anything that you throw at them, so if you’re interested in getting yourself one then speak to a representative and ask for toilet space to be built in. Underneath one of the bench seats could be a good place to put one so that it’s out of the way and not taking up extra room. Every product can be improved, and this is something that Four Wheel know very well. Their honesty about the growth and improvements of their vehicles is refreshing, and they only add a new feature or change an existing one when they know that they can do it to the best of their ability and in a way that maximises the experience for the customer. Take the window through into the cab from the camper for example; they used to have a slide back window but stripped it out when the manufacturer changed their design. The old design was causing leakages into the cab, so they decided to go with a fixed window until they can get a product that they’re totally happy with. While I agree that it would be great to be able to reach through to the back seat, I’m glad Four Wheel aren’t afraid to backtrack on ideas and take their time on these changes. 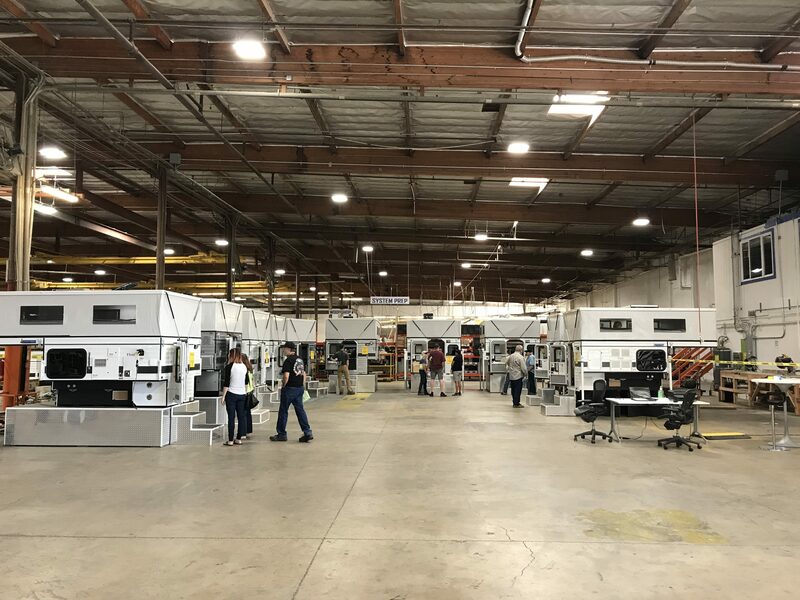 Customers enjoying the Four Wheel open day at the main factory in Woodland, California. We’d like to see the ability to turn the gas on and off from the inside of the camper rather than having to step outside. 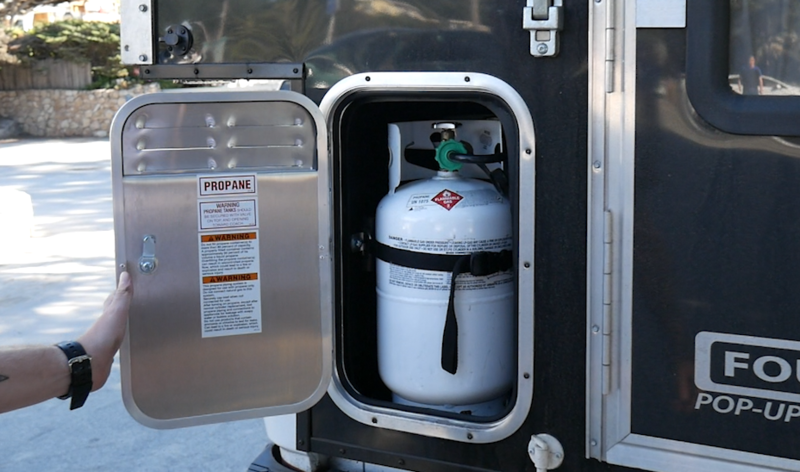 While there is a lot of safety precautions in the vehicle and a hardwired propane alarm in case of gas leakages, we like to know the gas is turned off before we head to bed, just to be on the safe side. Plenty of people don’t mind leaving their gas on overnight, especially if they’re in cold temperatures, so I guess that this is a matter of personal preference. It’s fine and safe to leave it on, but we’d like the option all the same. These Four Wheel Campers are fit for He-Man . I HAVE THE POWER! In future models, we’d also like to see some changes to the back door curtain on the camper. At the minute you can only draw it closed when the door is open because of the mosquito netting panel. Small things I know, and the mosquito netting was a godsend in the forests by Lake Tahoe, but we’d like to be able to close the curtains with the door closed too. Maybe this is something that you could mention in your own custom build! ‘Why should I buy one these four wheel campers over a camper van’, I hear you asking. We’ve got a lot of reasons, but we’ve bullet-pointed the most important below. It’s quick to set up and less faff than putting up a conventional pop up camper or a tent. You can keep your same vehicle and attach the camper as and when you want it. It’s a perfect solution if you only want or can afford one vehicle and don’t like driving massive vans or RV’s. It’s perfect for the weekend warrior who enjoys getting off grid and the family of four that love the outdoors. They’re completely customisable and hand built by professionals who know their craft. Utilise AEV to make an off-road monster! And perhaps most importantly, they’re great value for money. The base models of both the ‘Hawk’ and the ‘Fleet’ cost $17’995.00 (£13’708.86) which is seriously cheap for a pop up camper. That’s a great cost for something that is already kitted out with everything that you need for basic living, and then you can think about more and more optional extras to make living off the grid more luxurious. You can find a long list of included and optional extras to make your own tiny home from home here. I’ve loved my time travelling around in these four wheel campers. 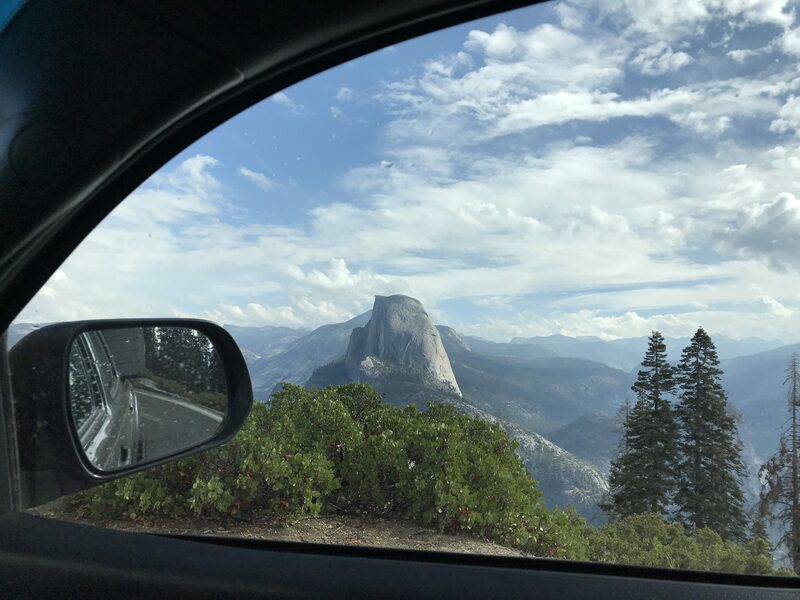 They have allowed us to get off grid and see California the way it was meant to be seen; from the open road. 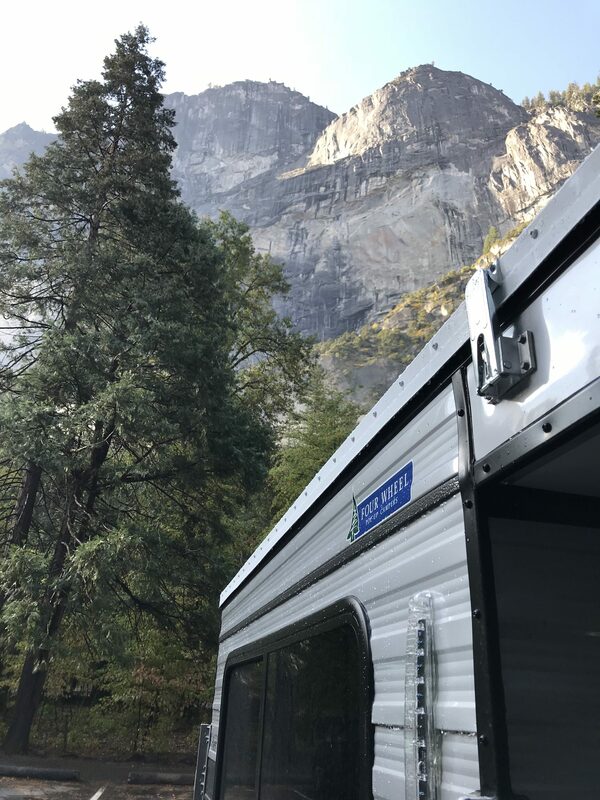 It didn’t matter whether we were at sea level or 10’000 feet up, driving along windy roads or cruising down highways, the campers felt as light as air on the backs of the trucks and were super simple to set up after a long day of driving. There was plenty of space for us both and to be honest we could have stayed in them and driven them for longer. In my opinion, these four wheel campers are for people who would like to get away for anything from a weekend to a week at a time max, unless you’re a hardened off grid adventurer with plenty of van life stories to tell of course. You can fit a family of four in them, but you’d have to be seriously close to last more than a week without banishing someone to the tent outside. But no matter how long you use them for you won’t be disappointed with their comfort, their durability, their functionality or the price. If you live in Europe then you can get one of these campers from Germany, and there will hopefully be a U.K dealer very soon. 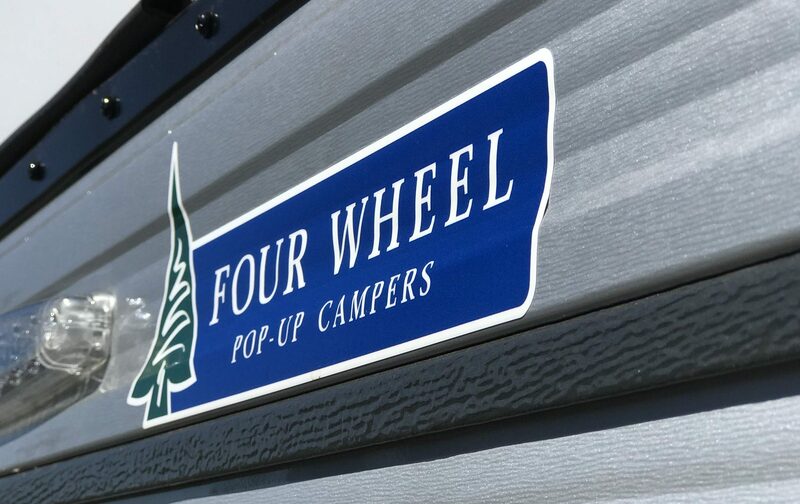 Check out Four Wheel online for more information about the campers, dealers and how to buy! Owl Car Cam– The only security solution that you need for your camper. Parrot Anafi – An affordable 4K drone for travel bloggers.